Are you one of or do you know the best and brightest working on capabilities aimed to make payments faster? Capabilities that not only improve speed but prove that faster really is better and can be secure? 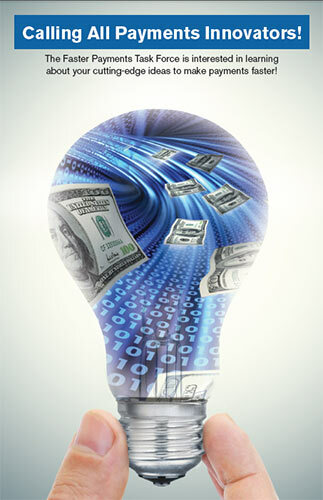 The Faster Payments Task Force is interested in learning about your cutting-edge innovations to make payments faster! The mission of the Faster Payments Task Force is to identify and evaluate approaches for implementing a safe, ubiquitous, faster payments capability in the United States. This cannot be achieved without the collective collaboration of innovative industry stakeholders – this means you and your fellow innovative brethren! The Faster Payments Task Force is establishing a Capabilities Showcase as a forum for providers to showcase capabilities, highlight areas of expertise, and foster opportunities for providers to link capabilities to potentially create a proposal – all in support of faster payments solutions! If you have a capability that you would like to share with the Faster Payments Task Force, sign up here to receive additional information. Share the wealth! If you know someone who may also want to share their innovative capabilities, please let them know about this exciting opportunity. Want to get up to speed on the work being done by the Faster Payments Task Force? Check out this video and/or review the Faster Payments Task Force page found under “Get Involved.” If you have any questions, please contact us at FasterPaymentsTaskForce@chi.frb.org or in the comments section below. This entry was posted in Payment Improvement, Speed. Bookmark the permalink.